Discovery Meeting—Determining your needs and understanding your requirements. Targeted Presentation & Solution Designs—Detailed plans and approach showing how technology will be used to solve your business challenges and how it will be implemented. Cost Benefit Analysis & TCO—3 and 5 year detailed models. Proof-of-concept Demonstration—When appropriate, we build proof-of-concept applications to demonstrate the effectiveness of a solution and how the technology can work for you. Recommendation—A comprehensive recommendation expressed in terms of our solution and any required home-grown or third party and partner solutions. We offer a wide range of purchasing, outsourcing, consulting and bundling options through our Flexbuy™ program designed to make our solutions fit any budget. We back this up with Guarantees, Warranties, Maintenance and Support as well as Service Level Agreements (SLA) that make Diagenix one of the most affordable choices in the industry. Fixed-Cost—Purchase Teleframe® hardware and software options along with any application customization and integration services for one low fixed-price. A-La-Carte—Purchase Teleframe® hardware and software options for a quoted fixed price. Additional customization, integration, or consulting services are provided on a T&M basis. 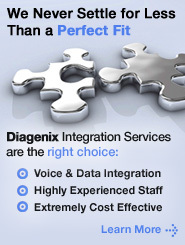 Outsource—Let Diagenix host your voice applications in our state-of-the-art carrier-grade service center. This is the most inexpensive way to get the benefits of leading technology for a small one-time setup charge and low monthly rates based on usage. This option also enables you to earn quarterly conversion credits equal to a percentage of your monthly invoice that could be applied to the purchase of an in-house solution utilizing any of the Flexbuy™ program options. Customer may request an RMA number within fifteen (15) days of receipt of goods. RMAs are valid for ten (10) business days from the date of issuance. A Return Material Authorization (RMA) number must accompany each item of merchandise. All returns MUST be returned in appropriate packaging, which must be placed inside of the original shipping box or must be returned in Diagenix ISTA (International Safe Transit Association) approved packaging. Returns must be complete with all manuals, cables, warranty cards, static bags, etc. just as the Customer received them. The customer is liable for damage due to improper packaging. For Resellers you are ultimately responsible for the condition of the returned items. These policies should be communicated to their end-user customer. Product will be returned to customer if found in other than sellable condition. The RMA number must be clearly marked on the outside of the return package or Diagenix will refuse the return shipment and without an RMA number will be returned to you unopened and at your expense. No open box returns for non-DOA products. Product box must be clean and undamaged, with no usage marks of any kind. This includes writing, stamps or shipping labels (i.e. Written RMA numbers). If product was shipped manufacturer sealed, it must be returned manufacturer sealed. If product was shipped to you double-boxed, it must be returned double-boxed. There will be a restocking fee of 20% on returns resulting from customer error. All servers, including custom configured servers and /or integrated systems are non-returnable. Individual components are covered by the manufacturer’s warranty and Diagenix extended warranty. Diagenix does not accept returns of Services, Maintenance and Support, Monitors and Network/phone System Products and Custom Products such as: Nuance Software and Envision Software. All software must be in the original, factory sealed package to be eligible for return. Electronically transmitted software carries the manufacturer's warranty and return policies only. For customers on credit terms, credit will be applied to your account when the product is received by Diagenix minus the restocking fee. For customers on C.O.D. or Credit Card status you will receive a refund/credit to your card when the product is received by Diagenix minus the restocking fee. An RMA number must be assigned as noted above. For customers on credit terms, credit will be applied to your account when the product is received by Diagenix. Replacement product will be sent in advance, freight free via UPS Ground. For customers on C.O.D. or Credit Card status, replacement product will be sent upon receipt of product by Diagenix. If desired, we will send replacement product utilizing your normal C.O.D./Credit Card status, and you may request from the accounting department a refund/credit to your card when defective product is received by Diagenix. Detailed description of the reason for the return. Please Note: Items designated as “Special Order” will not be eligible for return to Diagenix. If Diagenix receives a Purchase Order to deliver these items, Customer may not cancel the Purchase Order prior to shipping the items as all sales associated with these designated items are final as of the date indicated on the Purchase Order. Is Diagenix a public or private company?